Culture is your second most important problem after finding product-market fit. This week, we are launching cultureboom.co! It is a culture building tool for fast scaling tech organizations with 10+ people. The goal is to deliver a three-step solution (take the test / get the box / get heard) in 2 weeks and at 10% of the traditional cost of hiring a consultant. But why is there a need for such a product in the first place? Who would use it? What is the actual product? Why me? Why now? This essay is about those five questions. The first issue of a startup is to validate the product — market fit. This ensures the scalability and eventual profitability of the business. The second issue of a startup is to create the right company culture. This includes anything people and organization related. What is the best time for a startup to prioritize focusing on culture? While startup founders have a plethora of resources, services, products and expertise at their fingertips to assist them with the first issue; for the second issue, they are looking at an underserved market. This is what cultureboom.co tries to alleviate. Startups are the change engines of the world. Especially today, the barriers to entry for setting up a business are almost non-existent. Yet, still, there are many hurdles to be overcome by the founders and the early team, if they want to actually grow their budding businesses into something that actually create value and meaning —for their employees, as well as customers. Let’s take a look at few key aspects of people & culture to really appreciate its effect on the business. Culture is the over-arching concept that includes all parts of the business that has to do with how people communicate and work together. This turns out to be the most important differentiator if a startup wants to compete in its niche. A great company culture represents a well-oiled, harmonious machine. It is an immense unfair advantage. It is for founders and leaders of scaleups that have reached 10+ people, but have no time and a very limited budget for culture building actions. It is ideal for startups that have nailed their initial product-market fit, found a way to scalability & revenue and now are at a stage for even bigger growth. 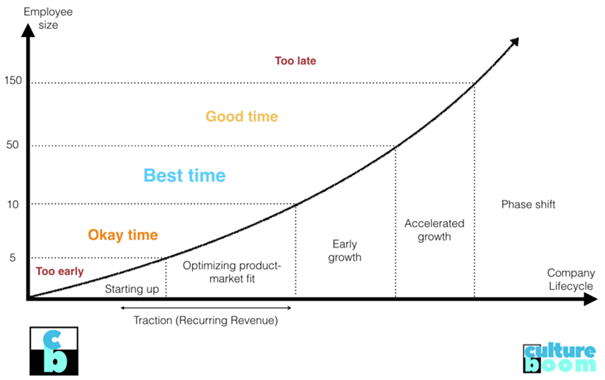 In one word: it is for scaleups. The conception of a company culture is the day the second person comes into the team (or perhaps even earlier — hidden in the business ethos and the character of the founder). So when people say, “Culture should be your consideration from day one!” I agree with that wholeheartedly. Yet still, we don’t live in an ideal world. As an entrepreneur I know very well that if there isn’t a product-market fit and potential for revenue, there is no company, hence no culture. So it is very understandable culture taking the back seat during very early days. While focusing on culture as early as possible is great, what we suggest is the best compromise. In other words, you have to focus on culture when you hit 10 people, otherwise, a barrage of problems that will get more and more difficult with time are on the horizon. 3. What’s in the box? Cultureboom offers a well-defined product with a clear budget. First step: Take the test. 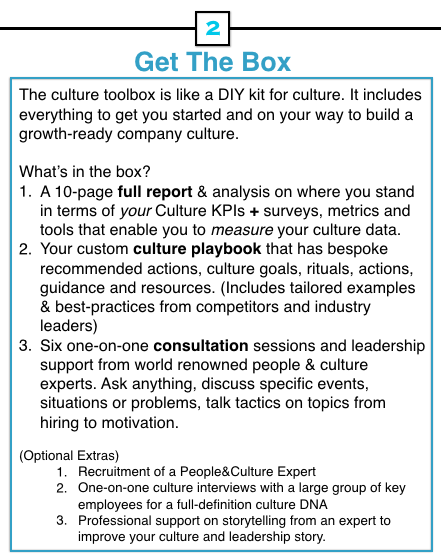 You can take the culture test and find out How Growth-Ready your Culture is. Second step: Get the box. 1. We use the data you’ve provided to crunch out your Culture Metrics and our People & Culture experts deliver you a full 10-page analysis of the data. Think of these as Key Performance Indicators (KPIs) for culture. With the help of these, what is otherwise very abstract is now measurable. 2. We author the first iteration of your Culture Playbook to kick-start your focused culture building efforts. The Culture Playbook includes bespoke actions you need to follow through. Culture goals, recruitment strategies, goal setting tactics and frameworks, meeting and strategy communication types right for your business. 3. You also get six, one-on-one consultation session credits with a dedicated people & culture expert to work through more complex problems and strategize solutions. Successful businesses curate their story and employer brand. Getting heard is vital to growth. To support that, we first write a long form editorial showcasing your company culture. Second we conduct podcast interviews with the founders telling your culture story to the masses and make sure your story is heard. My decision to build cultureboom.co is no coincidence. My domain expertise is in people, culture and learning. I have seen the academia, worked at management consultancy firms, large tech corporations and as an entrepreneur. The thread that have always combined whatever I did (or wished to do) can be summarized with those three words: people, culture and learning. After years of soul searching, I have found what describes me the most. I am a maker. No, I don’t work with open-source hardware, do engineering projects, work with electronics. Neither do I have 3D printer! But I have found the courage to call myself a maker after all these years, because I identify with the spirit of the movement: Enjoyment and fulfillment through creation; informal, networked, peer-led, shared learning. So yes, I am maker. I just make different things. Mainly, books, startups, side-projects or other content such as text or video essays on my domain expertise. This is me, working away in my office. A portfolio of almost all of the things I’ve made are here. Launching my own startups, working with lots of businesses as a consultant and perhaps most importantly obsessing about the future of life and business in general I have come the believe this firmly: The success of a startups depends more and more on its culture each days. There is a logical reason behind this. As a general rule I’ve observed; as technology gets more simple and intuitive in its frontend, the components in the backend get more complex. Which means, companies who want to have a competitive edge have to manage two things. (1) Have good human-machine integration and (2) have good human-human integration (culture) to to scale their value creation. The more robust culture a startup has, the better its chances of competing. Good products solve a problem whose time has come. For such a product like Cultureboom to be able to exist, there needs to be enough of a market. This has two aspects: the size of the market and enough of an appetite in the target personas (mostly founders). This also implies; there needs to be enough people who have experienced the problems & challenges around building a startup culture. This is why I think 2019 is a great time to build such a solution. But what I think matters a little. Building good products and businesses are less like games of chance, and more like micro science experiments. This is why we are following a three- step validation process. For the first step of the validation; we have conducted a dozen customer interviews, asking scaleup founders who fit the persona questions about the type and size of their problems as it pertains to what we are building. It turns out they all want to focus on culture, but don’t know how to start. We found these results encouraging. For the second step of validation; we have built cultureboom.co as an MVP and the presented to Cultureboom Pitch to our target personas. At the end of these presentations we’ve asked the simple question: “Is this something that you would want to use?” The answers were overwhelmingly positive with 80% saying “yes”. The third step of validation is the actual purchase and delivery of the solution. This is where we currently stand. As there’s always the risk of a topic like culture taking the backseat in the priorities of organizations, we are still cautious. The good news is we have already secured our first two clients, and invite you to join them.Visit cultureboom.co here or send a question to ozzie@cultureboom.co to discuss further. Mention the word “boombox” anywhere in your message to receive a 25% early bird discount.